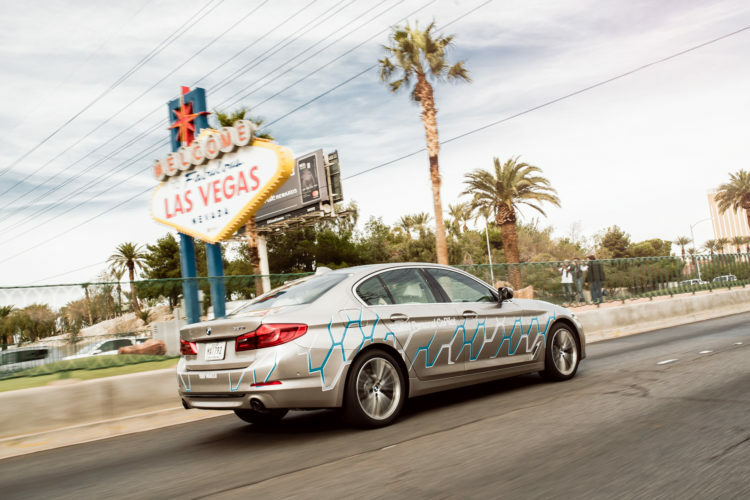 At CES 2017, BMWBLOG tested a prototype autonomous driving all-new 5 Series. Dubbed, the BMW Personal CoPilot, this is a completely hands off, eyes off, feet off experience for the driver. BMW is so confident in this system that they let us take it out in the evening as the sun was setting into full on Las Vegas rush hour traffic. 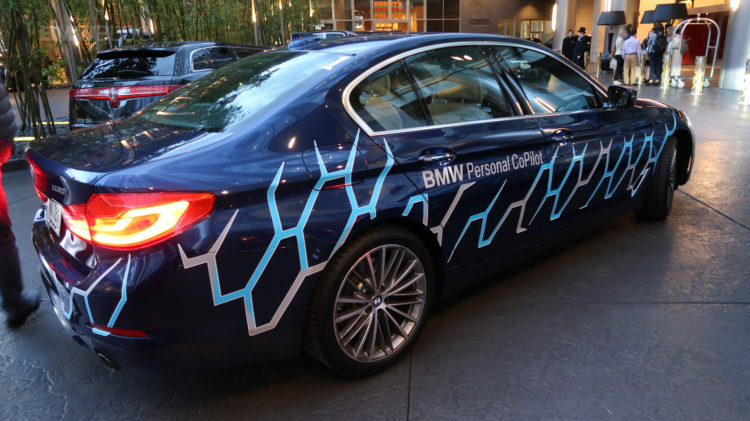 BMW is working with Mobileye and Intel Corp, using highly accurate GPS data, and other input from the car to help autonomously drive the car. BMW expects to start rolling out these features some time in the next 5 years. The reason they are being so cautious is that they want to be 100 percent certain the system is ready and without flaws before being implemented. BMW also discussed the challenges of adapting a system amongst many different automobiles in their fleet of different body types and styles. The whole prototype driving experience began with an immersion into the future of Mobility that BMW envisions with the BMW Connected Window. This demonstrated a typical day in someone’s life in 2022 where the Mobility Could lists your meetings for the day. When it’s time for you to go, the destination is automatically loaded into your BMW before you step foot in it. Open Mobility Cloud also takes note of the time it takes to get to the destination and even suggests your daughter could finish her Amazon Prime Video in the car if you so desire. If you agree, the video is pre-downloaded into your car before you set off. 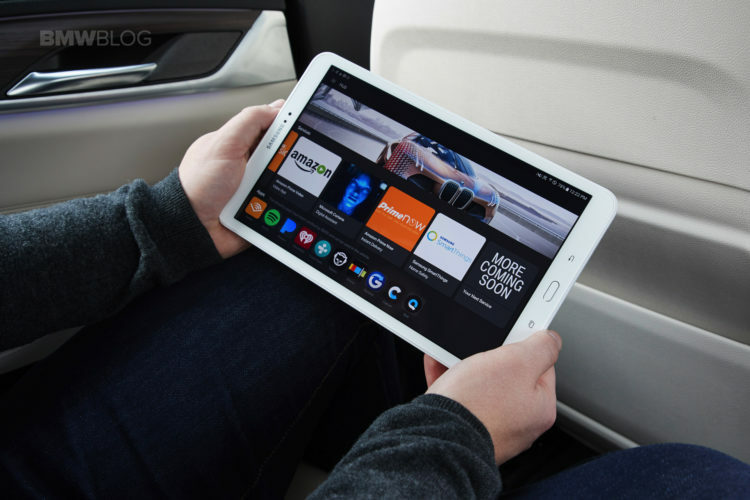 The whole point of this is that BMW is integrating the car so that you can plan what to do with the time that you gain while you don’t have to have hands on the wheel and demonstrate how mobility is integrated into people’s digital life. Now on to the driving. BMW was very serious about safety here and my test drive included a safety engineer in the front passenger seat ensuring that the autonomous driving was done in safe manner. Once the safety briefing was done, belts buckled and procedures explained we were off. At this point the engineer in the back seat began explaining everything special about the car. Yes this is based on the all-new G30 5 Series, however, these are all strictly test vehicles to validate BMW’s new self-driving system and won’t be seen on 5 Series vehicles anytime soon. These BMW Personal CoPilot vehicles have specialized computers in the trunk monitoring everything for the automated driving as well as special sensors that are not found in the upcoming 5 Series vehicle. To engage Autonomous driving, one merely needs engage the blue button on the left side of the steering wheel. It remains to be seen, however, exactly how BMW will a driver activate self driving when it gets implemented in production vehicles in 2021. Once we made it out of stop and go traffic off of the strip, we met up with the 5 Series’ big brother, a 7 Series that would drive in front of us the whole time were we letting our car drive itself. Our Bavarian convoy headed out onto I-15 going south with the 7 Series staying right in front of us the whole time on the interstate. Did I mention the Germans were serious about safety? There were three BMW engineers and two cars to one journalist! Once the big 7 had made its way on to the darkened freeway we jumped over a few lanes into the sea of traffic on I-15 with about two car lengths off his bumper. The safety engineer then gave the order to engage the automated driving. I finally got to push the special blue button on the steering wheel! There was no drama, the guys just had me lift my hands off the wheel and make sure my feet were off the pedals. A Green Steering Wheel and two green bars appeared on the center of the dash once autonomous drive was engaged. They asked me what I thought, and I answered “weird.” It is a totally foreign experience to completely let go of the driving while in the drivers seat. BMW is so confident that they had me doing Gesture Control to get information on points of interest as the car cruised at 60-70 mph down the freeway. A trip to the Shark Reef at The Mandalay Bay anyone? The 5 Series Head-Up display showed that the 5 Series was set to go no faster than 70 mph but initially our speed was limited by traffic. However as traffic got lighter and we went further south, the car automatically sped up. You could even see the steering wheel moving back and forth slightly keeping the BMW in dead center of the lane. 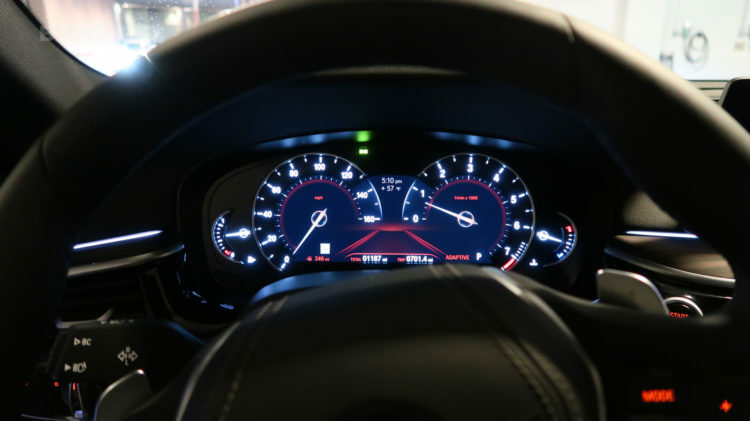 The guys were so confident in their cars self-driving ability, that they didn’t even mind when I got out my camera and started snapping pics of the dash and head up display as the car whisked us down the freeway. Finally it was time to drive the car again. Never thought I would be disappointed to drive a new BMW but the experience of the BMW driving itself in a very competent manner in rush hour traffic was actually kind of relaxing. Now I needed to navigate three lanes of traffic quickly to exit I-15 and head back to base. At CES 2017 BMW gives us a view into BMW’s vision of the future. A look at the future of driver integration, the BMW HoloActive Touch, Open Mobility Cloud helping to occupy the time you are in the car not driving. Autonomous driving BMW’s are just part of that future as BMW sees it. 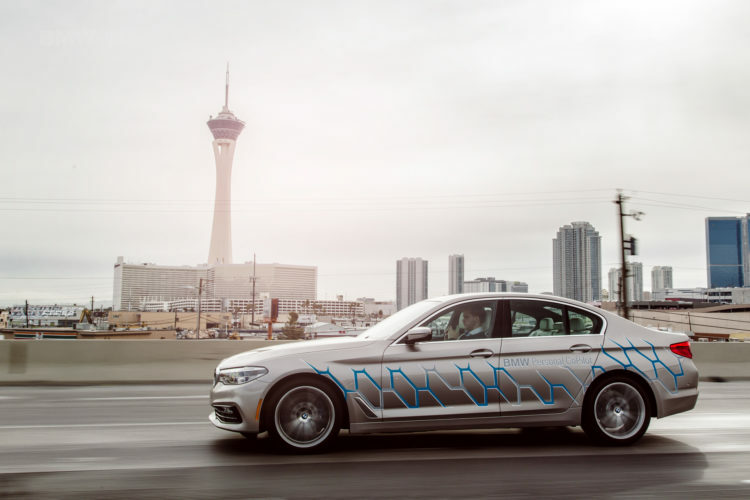 With their autonomous driving vehicle, BMW has a very polished product in their hand, and it is very encouraging to see how thoroughly they plan to test the automated driving before they release it into production. 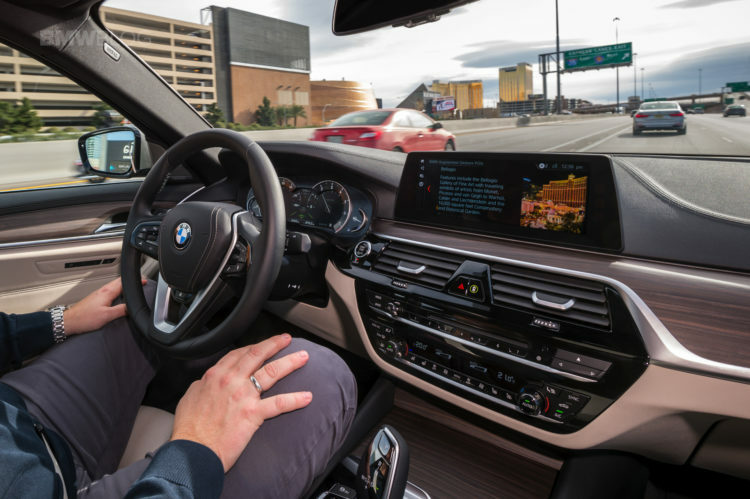 It doesn’t sound like BMW has any plans to beta test it on the drivers, they are going to deliver a 100% ready to go autonomous driving system.